Pioneer in yoga for children says the practice doesn't just change bodies, it changes lives. If you're looking for an athletic activity your children can enjoy and learn from, and in which they can experience a whole new level of personal growth and strength, consider the practice of yoga. Team sports provide fabulous lessons in cooperation, competition, and coordination. Yoga complements team sports by promoting body awareness, clarity, and self-respect. "Yoga???" you ask. Well, as a lifelong athlete myself, I asked the very same thing. Until I tried it, the world opened up and all I could think was "Yes!!! Yoga!!!" Yoga builds self-esteem. A child is always perfect in yoga. Anyone can succeed at yoga. The integrity is in the effort and even non-athletic children will excel in the practice. Yoga is theraputic. Yoga can be used as therapy for the entire spectrum of special needs, physical, emotional and mental. Yoga has physical benefits: Strength, balance, focus, flexibility and coordination are just a few of the physical benefits of yoga. Yoga benefits children mentally and emotionally: Children who practice yoga perform better in academics, behave better in everyday life, and have increased levels of self-control. Yoga helps kids cope with stress: With all the stresses kids experience growing up these days, yoga provides children with tools for coping with insecurities and challenges. Once you've decided to get your child involved in yoga, there are two basic routes to explore: live instruction and DVDs. I recommend an instructor. DVDs don't provide personal connection or feedback. Have at least a children's certification from a reputable children's yoga program. Preferably have a 200+ hour adult certification, as well. Connect easily with your child and quickly build trust. If you're lucky, there will be a kids' program in your area (Google will find it for you) and/or nearby studio classes for kids. If you're a little less lucky, you might have to do some digging. Contact your local studio or a program like mini yogis® yoga for kids, which has trained teachers globally and may have resources in your city. In a typical class, children will spend 5-10 minutes meditating (with or without breathwork) at both the start and finish. 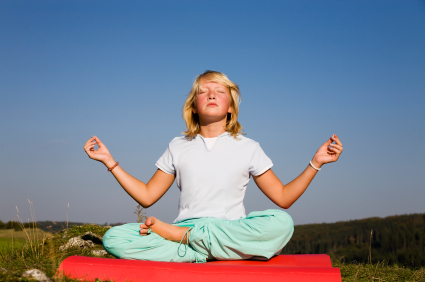 This practice teaches children how to calm themselves down, focus, and become less reactive. Closely tied to meditation is breathwork. Children will learn how to use their breath as an everyday tool for controlling anger, frustration, and other negative emotions. Of course, the predominance of the yoga class will be focused on physical postures. These can be very simple or very challenging, depending on the level of the student (and, for that matter, the teacher). A strong teacher will be able to modify the challenge from child to child and provide a very personal practice. Yoga is not a results- or performance-based practice, meaning ... all children are experts. If they try it, they are doing it. This is a very empowering dynamic in a world that constantly seems to be telling children, "Do this. Don't do that." There is freedom and confidence that stems from the practice and follows a child throughout his or her life. Finally, a well-trained teacher will be knowledgeable about yogic philosophy and its practical, daily applications. Children will be instilled with principles of kindness, nonjudgmental behavior, open-mindedness, and acceptance of both oneself and of others. Bottom line, yoga doesn't just change bodies, it changes lives. And the results are simply wonderful. A pioneer in the children's yoga community, Shana Meyerson has taught teachers all over the world how to teach children in a fun, safe, and mindful way. Her intuitive and integrative approach to teaching allows her to positively change the lives of both typically developing and special needs children. Trained in classical yoga by one of the world's most renowned yogis, Sri Dharma Mittra, Shana considers her teaching an offering to the sweet innocence of children and the lives that lay ahead of them. Shana founded Los Angeles-based mini yogis yoga  for kids in 2002, and is featured in the documentary film Yogawoman  about the powerful impact of yoga on women of all ages.